Having perfect hair requires constant attention, but whipping out a sissy hair brush just won't keep in tune with your manly attitude. That's why you need the kind of comb that looks a little like a weapon. 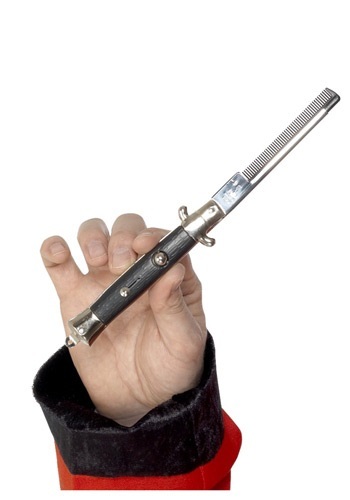 This 50’s Style Switch Blade Comb is spring loaded so at the flick of a button this switchblade looks like you're about to take some punk out, but then you can just casually comb your hair as the rest of the room is captured in suspense. The 50’s were all about 2 things, having good hair and looking tough so why not kill two birds with one stone and add a little something extra to your 50’s inspired costume this year. The Greasers would be impressed by your authenticity. Stay golden Ponyboy!